I’m re-posting my “word gap” essay that appeared on the Huffington Post: http://www.huffingtonpost.com/marjorie-faulstich-orellana/a-different-kind-of-word-_b_10030876.html here, as part of an effort to get alternative perspectives on this “gap” out into the world. Google the term “word gap” and you get a slew of websites that treat the concept unproblematically, assuming and reinforcing deficit views. At the same time, there’s something problematic about challenging deficit perspectives just by flipping the script. So I include an addendum below. The supposed “word gap” between children growing up in white middle class homes, and those growing up poor, immigrant or otherwise culturally “non-dominant” families has received a great deal of attention in recent months. Intervention programs in poor and immigrant communities aimed at increasing the number of words parents speak to their children have offered easy fixes to entrenched social problems. If parents would just feed their children more words, these children would grow cognitively, achieve in school, succeed in life and all would be well in the world. The study that initiated attention to this supposed gap (Hart and Risely, 2003) rests on uncertain foundations. Did Betty Hart and Todd Risley count all of the words in children’s environments? Or only those that were directed specifically to the child? By all parties (siblings, aunts, neighbors, friends) or just parents to children? Or just mothers? Never mind the fact that these words were counted by researchers who had stepped into homes — without all the work that ethnographers do to build relations and rapport so that people are comfortable with our presence as we “study” them. If I were a poor, minority or immigrant parent, I would likely shut my mouth and count the time until the researcher left. Contradictory evidence is emerging as researchers attempt to replicate Hart and Risely’s study. In short, there seems to be tremendous variation in the number of words that children in different households and communities are exposed to, as well as in their quality. These differences do not fall into a neat pattern that reveals a word gap between poor and middle class, white and non-white or any other binary. But if we are going to focus on word gaps between groups, we might consider what gaps call our attention, and what ones escape our notice. Why are some the cause of great anxiety, and others not considered a problem at all? Why are words seen and heard — and treated as valuable resources — in some spaces, while other “word wealth” goes unnoticed and unappreciated? Urban communities in globalized cities like Los Angeles are filled with words. There is an abundance of word wealth alive for the taking by children who walk through the streets of Los Angeles every day on their way to and from school. This is a much more print-rich environment than any suburban neighborhood I’ve seen. Store windows are filled with product labels and announcements in multiple languages other languages. There are advertisements and announcements on buses, trucks and vans — large and small billboards selling a revolving global marketplace of items such as the new Volkswagon Jetta, Tequila from Jalisco, Samsung phone service and Direct TV. There are street and parking signs of different shapes, sizes and coloring. There is print on traffic signs, parking meters, gum ball machines, pavement and walls. Words and images referencing contemporary popular culture are stamped on the backpacks and T-shirts of the people walking by. The print is encoded in a huge array of styles, fonts, layouts and arrangements, conveying meaning in the words themselves as well as through their juxtaposition with other images, texts and signs. Just as words spoken in homes are not all directed at children, children walking these streets do not directly decode all the signs, of course. But as I learned when I conducted a community literacy walk with first graders in central Los Angeles (Orellana and Hernández, 1999) young children have a great deal to say about the print that is of interest to them. And even if they do not read every word, they are regularly exposed to the rich variety of ways that adults use texts to express ideas and make meaning in the world. Shouldn’t we pity the poor suburban kids who have to rely on their parents to put magnetic alphabet letters on their refrigerators to get a little bit of exposure to environmental print? Shouldn’t we worry that that print they are exposed to is likely only in English? Perhaps we should stage an intervention, force-feeding multi-lingual signage into suburban communities as a quick fix for the multi-lingual word gap that middle-class parents don’t seem to see. Then we can count the number of times people look at the words when they are out walking in their community — if indeed they walk at all. In my “word gap” blog (above), I suggested that middle-class children living in monolingual English-speaking suburban communities are limited by their lack of exposure to the multi-lingual print-rich environments of urban immigrant communities. I named this gap between urban and suburban print environments as a way of countering dominant discourses about deficits, for rhetorical effect: to raise questions about why some presumed deficits call our attention while others escape notice. I also questioned the research surveillance that is brought to bear on certain communities and not on others. Flipping scripts can be fun, and may help us to see things we take for granted in new ways. 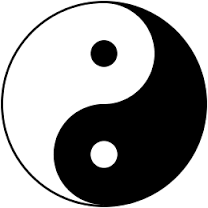 But it tends to keep us locked in binaries of good and bad, right and wrong, deficits and assets. This just perpetuates a much more entrenched problem in educational research and practice: the emphasis on naming problems, identifying gaps, circling errors, pointing out what’s missing or misguided or wrong….rather than seeing potential and possibility. What if educators regularly and consistently simply asserted an assets-based perspective about all people, pointing to buds of development, and nurturing them, rather than focusing on what is missing, misguided, or wrong? In Teacher Education programs, including the one I work in at UCLA (https://centerx.gseis.ucla.edu/teacher-education), much attention goes to countering “deficit discourses” about students from non-dominant cultural groups. We ask pre-service teachers to identify the cultural competencies that all children bring to school from their everyday lives. An assets-based perspective may help us to see the print that abounds in urban communities as a resource, as I noted in my last two blogs. It orients us to hear multi-lingualism as wealth, not a limitation. It points us to possibilities and potentialities, not problems. This is very important as teachers work with families and communities from non-dominant cultural groups, whose skills and experiences are so often not seen, valued, or understood. At the same time, a deficit orientation is not uniquely an issue for our work in underserved communities. Really, our entire educational system – and larger culture – tends toward critique. We are good at judging, evaluating, and circling errors – pointing out what’s missing, misguided, or wrong. We sometimes do all right at praising things that meet our pre-determined norms. But we are not very good at seeing potential in things that we don’t already agree with: seeing what is there, in nascent form, ready to be built upon. We are also not so good at seeing different kinds of competencies. Comparing to idealized, socially constructed, singular, and often impossible standards, we find most things and people (including ourselves) lacking. Many of us have deeply internalized the critiques that abound in the larger culture and that were reinforced from our many days in school. We are more aware of our faults and weaknesses than we are of our strengths. A deep sense of “not being good enough” pervades our psyches, whether we know it or not. This may lead us to project our fears and insecurities onto others, bury them in food, drink, consumerism or other addictions, or avoid judgment by not taking risks, doing only what others tell us to do, and keeping ourselves small. In rebelling against this system, is it enough to turn the critiques around? Should we just point to different problems, find other people lacking, and cast judgments in a new way? This is what I did when I “flipped the script” in my word gap blog. I stand by this for its rhetorical value, as a way of hearing the scripts that dominate our thinking. In this same blog I made another common rhetorical move: I pointed my finger at a faceless, nameless, categorical “other” group. In this case, this “generalized other” were middle class people living in suburban communities, whom I presumed to be white, and monolingual. Let me personalize this. I am or have been part of that categorical other for much of my life. Even so, I did have experiences that became foundational to my later study of cultural diversity or “transculturality.” I was a middle child of eight. Being in the middle helped me to see the world from different perspectives and to recognize that there are different ways of seeing the world. And the seemingly homogeneous suburban community I grew up in really wasn’t homogeneous at all, because there was much variation within the “white suburban” experience. I observed it, wondered about it, and tried to figure out my own values and beliefs in relation to the various ways I saw modeled all around me. These were experiences that provided a foundation for the work I have done as an adult in trying to understand, appreciate, and cultivate transculturality. This is true for all people, in all areas of learning and of life. We all have experiences that can be built upon. We all have wealth that goes unrecognized, undervalued, and untapped. I am not saying we should close our eyes to inequities in resources. Problems in resource allocation are real and must be named and addressed. But let’s notice what problems we see and what ones escape notice. And then, let’s not just name problems, not just flip scrips, not just perpetuate the same old problems in some new form. Let’s find places of possibility that may help us build the world we want to live in. Eliminating the “nots” and the “don’ts.” When I find myself noticing what anyone is not doing, or what she or he doesn’t seem to know, I ask myself, “What are they doing?” “What do they know?” And – what does the negative framing reveal about what I assumed they should know or do? What does it keep me from seeing? Over-writing the grammar of my own thinking. The tiny words that connect our thoughts can the reveal what we think of as normative, correct, right, wrong or true. “I like what you wrote, but….” implies that I didn’t really like it that much at all, or at least, that I’m more focused on what I don’t like than what I do. Switching the “but” for “and” keeps me oriented to what is there, and could be built upon with whatever ideas I might have to offer. Un-comparability: When I find myself comparing people (including myself), on any measure I ask myself, “Would I ever do this with a tree?” Would I ever expect all flowers to be the same size, shape and color? This doesn’t mean I forgo all criteria: some plants are healthier than others, because they have the benefits of soil and sun. But would I want a garden full of flowers that all looked just the same? Embracing imperfection: This is the hardest one for me, as it for so many of us who have been trained in the Western world’s elusive quest for perfection (on impossible, socially constructed standards). 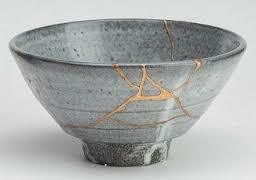 In contrast, the Japanese aesthetic tradition of “Wabi-sabi” cele brates “flawed beauty.” (See http://www.utne.com/mind-and-body/wabi-sabi.aspx and http://nobleharbor.com/tea/chado/WhatIsWabi-Sabi.htm). Quirks and “errors” in construction ensure uniqueness in an object. Rust, cracks, and fading colors remind us that there is no impermeable standard of beauty that is not changed by the march of time. I still have a lot of un-learning to do as I try to embrace and enact these new ways. I tend to focus on where I fall short. After all, I have 16 years of training in Western schooling that oriented me to do just that (plus thirty more years working in its machinations – ten as an elementary school teacher and twenty as a college professor). But then I just get to ask myself, “falling short by what measure?” and start all over again. *Please note that there is a rather irrelevant photo attached to the word gap essay on the Huffington Post: a multilingual “thank you” sign. I certainly value multilingualism, and gratitude, but the image doesn’t fit with the piece. I tried to get the Huffington Post to remove it, but to no avail. So I just have to embrace this imperfection!